I traditionally teach a Mexican-inspired menu during the month of April so that my students have some fun recipes to cook for their family and friends on Cinco de Mayo. I am obsessed with Mexican food, so I really look forward to this time of year. Of course, April has come to an end and sadly, so will my daily fish tacos. I wish it were Cinco de Mayo every month! I usually have no problem coming up with an entree for a Mexican-inspired meal, but sometimes the sides stump me. Here’s a winner for Cinco de Mayo or any night. 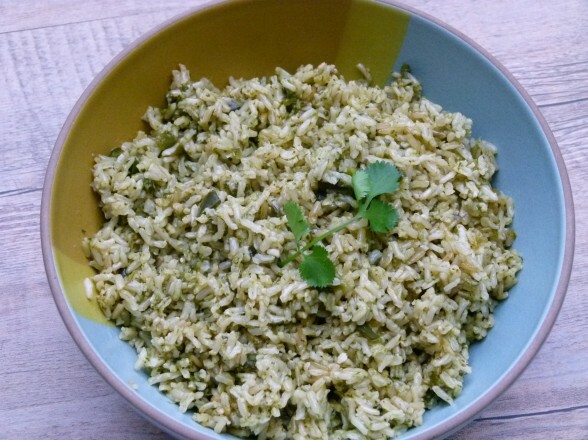 This green rice was originally inspired by a recipe in one of my favorite cookbooks, Sunday Suppers at Lucques. 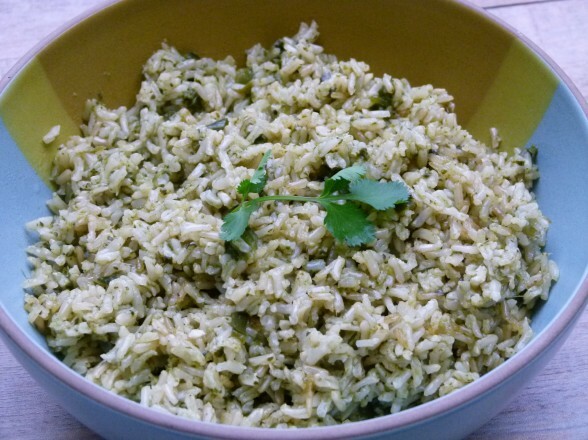 I’ve simplified the recipe a bit, but it is still unbelievably tasty and reminiscent of the green rice you may have had at a Mexican restaurant. The color is pretty subtle, unlike the the spinach risotto recipe I posted last month, but green enough that no one will know if you made it with brown rice or white. Pretty tricky! There are so many things to love about this green rice. For one, it’s delicious! I adore basmati rice, which I think naturally tastes better than almost all other rices. But in my opinion it’s hard to beat rice with garlic, butter and salt. The flavor from the onions, pepper and cilantro are just a nice bonus. Green rice is also very versatile. Besides being the perfect side dish to fajitas, tacos or Mexican beans, this rice can easily be made into a vegetarian entree with the addition of some cooked pinto beans or sliced almonds. Combined with some protein, green rice makes a perfect school lunch. On the weekends, I’ll use leftovers in a burrito with beans. Yum! This recipe is also easy. Don’t let the blender discourage you. Think of it as a friend who will chop your cilantro and spinach into the bittiest pieces so you don’t have to. Last but not least, whole grain brown rice with spinach, herbs and garlic — are good for you! If you have eaters in the house who are green-averse, see if they’ll be more inclined to eat the rice with corn tortilla chips crumbled on top. If not, add it to chicken and avocado soup, vegetable chili or freeze it for a rainy day. Of course, you can do what I do and eat it for breakfast with some eggs and guacamole! 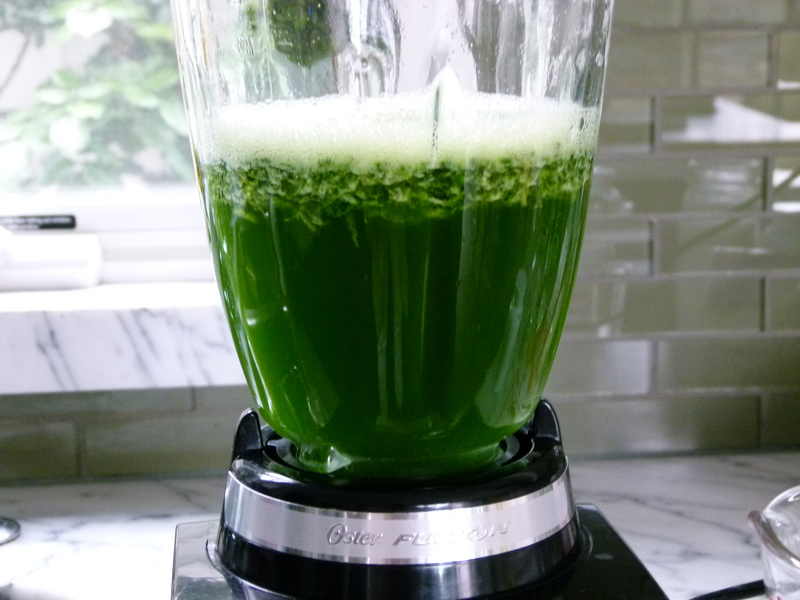 Put the cilantro, spinach, and 1 ¼ cups of water in a blender and blend until pureed. Add the remaining 1 ½ cups of water and salt and blend until well combined. In a medium (3 qt) heavy-bottomed saucepan with a tight-fitting lid, heat oil and butter over medium heat. When butter is melted, add the rice and sauté, stirring about every 30 seconds, until it just begins to brown, 3-4 minutes. Add the onion, garlic and chili and cook 1-2 minutes, stirring constantly. Add the contents of the blender, stir well, turn heat to high and bring to a boil. Cover the pan, turn the heat to low, and simmer for 50 minutes. Fluff with a fork, cover, and cook another 5 minutes. Take the pan off the heat and let the rice steam in the covered pot for 10 minutes or until you are ready to serve. If you use white rice, reduce cook time to 20 minutes. Hi Pamela. The hubby HATES cilantro with a passion and claims to be “allergic” (I love it). I usually just omit cilantro in all recipes but will it taste the same in this one if I just omit it? Or can I substitute it with something else? Thanks. I get it. My husband has some “allergies” too. 😉 Just omit it and try replacing it with some dill and parsley. It will still be delicious! I made it last night and left out the cilantro. It was delicious and everyone loved it! Thanks for your amazing recipes and website! No one knew there was spinach in it. Your a genius. If I make this in advance (morning) for dinner, how do you recommend reheating it, Pamela? Hi Debra, I adore Jodi! I’m glad you stopped by :). I have 2 taco recipes on the site — ground turkey/beef and grilled fish tacos. Check with Jodi about joining her group for a class. I’d love to have you there! Making fish tacos AGAIN tonight with the green rice. It’s one of my family’s favorite meals. They love the rub version. Simply delicious! That’s great to hear, Jodi! I finally made this arroz verde dish and just loved it, especially the cilantro which is a favorite herb of mine. The remaining rice will be put to good use with the leftover veggie chili I made yesterday! Yum! Looking forward to it! Made this tonight! So yummy! 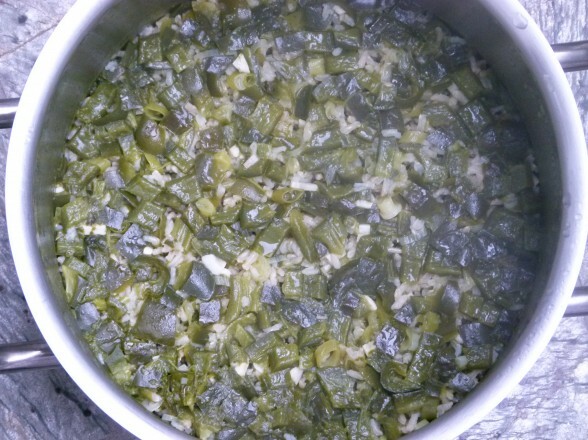 My family all said they thought there was tomatillo in it…so flavorful and fresh! lots of “mmmmmmmm”‘s all around. 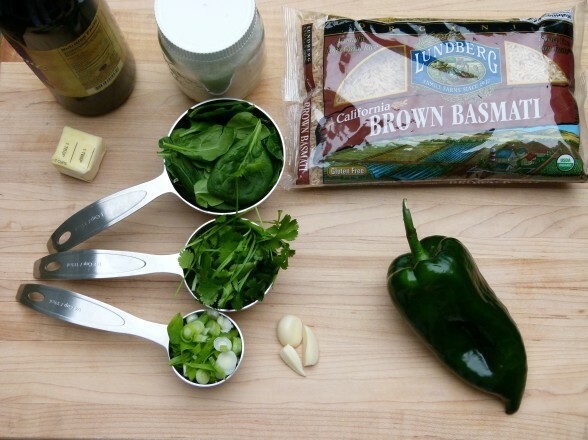 Mexican flavor without being overbearing or heavy…I roasted the poblano pepper this morning and used chicken stock in the spinach mixture…it was super simple to put together! Will definitely make again! delicous!!! Thank you. You make cooking fun for me again! That’s a huge compliment. Thank you, Sharon!